Why are wooden chimes reserved just for the wind? We can play on wood too as well as metal. 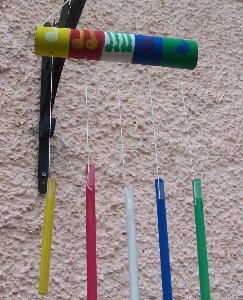 So get ready because we`re going to make a colorful set of bar chimes to add to our homemade musical instruments. Here they are in the picture. They look very colorful and they make a nice sound when you strike them with a stick. I hung mine up in the garden and the wind took over and played the chimes with a gentle breeze. Now I am going to show you how to construct them. The crew along with other children will also make them on the first day of our Summer Workshop. Did you salvage a kitchen towel tube? You will need one for your wooden chimes project along with five dowels cut to various lengths. 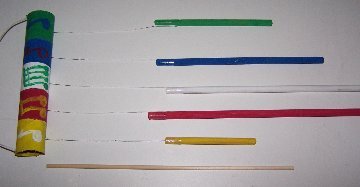 You will also need 3 tooth picks, about 3 m of string, and 5 colors of paint. 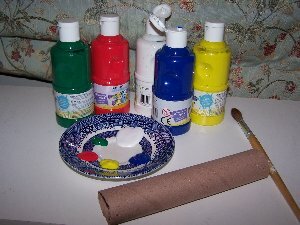 Divide your cardboard tube into 5 even sections and paint them each their own color. Let it dry and paint again if your paint is a bit thin. 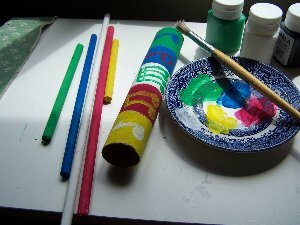 Paint each dowel its own color as you see in the photo illustration. You can also paint a design at this stage. Whatever you choose, make it bold for a good effect. We painted musical notes on ours. To make the holes in your tube for the chimes to hang from, you can use a sharp object like a pencil or the end of your scissors. Be careful though! You could ask an older person to do this for you. Make sure each hole is centered in each colored section along the tube so that you have 5 holes, and they must be level with each other. To do this mark a faint straight line along the tube to guide where the holes should be. 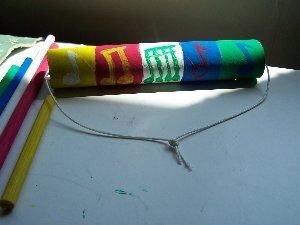 The wooden chimes need a handle which you can make from string. 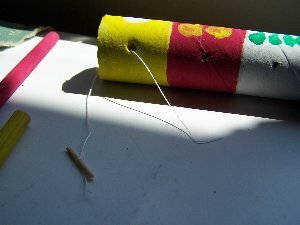 Cut at least 40 cm of string and thread through the tube. Next, tie it in a knot and pull the knot to the inside of the tube so it is hidden. 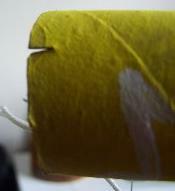 Make a small notch at each end of the tube on the top, the opposite side from the holes for the string to slot into. This will keep your chimes stable and stop the tube from turning round. Cut the rest of the string into 5 even lengthened pieces and thread each one through a hole to the inside. Keep pushing the string through until it comes out of one of the ends. It doesn`t matter which end. Break the 3 tooth pics in half, and tie each string end tightly around one. Pull them back into the tube when tied so that the string is secure. All that is left to do is to bind each dowel to the end of the strings with some sticky tape. Wrap them tight and they will stay on. 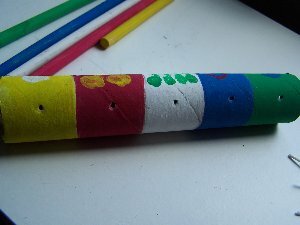 Make sure to color match them with the tube colors and your wooden chimes are finished. This is a KKC original idea.